The degree show opened earlier this week and we had the private view on Tuesday. To see how I made the tree piece click here and here. Our business cards are all kept together in these specially made pigeon holes. My work seems to be getting a fair bit of attention. I love seeing people walk around the entire house and peer into each window. And so that you guys don't feel left out, here's a video showing my work so you can view it as if you're there! The other artist who have work in this room are Clare Mills, Andy Reeve, Jon Jensen, and Will Reid. Andy has already sold two of his piece. One of them was to John Hurt. You know, famous actor John Hurt. He's the new provost for our university. When he looked round he didn't seem to interest by my work, as he was too busy figuring out which of Andy's he was going to buy (the most expensive!). But his wife had a good look at my work! If you happen to be in Norwich the degree show is on until Tuesday 3rd July. This book used to be my favourite when I was younger. Because it was my doodle book! My Dad got this book from his work and it's full of blank pages ready to be drawn on. Half of it is shiny paper perfect for felt tip pens and biros and the other half is matt paper for pencils. Dolphin eating chocolate and drinking 'Cola'? Check. A chef with checked trousers serving lobster? Check. 3-headed guy with a funky sweater? Yep, there's one of those too. Being a girl there's a lot of drawings of ladies in big dresses. This is one of the stranger ones. Why are her hands poking out from those mad hips? This lady who looks like her dog also belongs on the crazy train. As a kid I liked drawing conveyor belts and machines (I could watch this clip over and over), so here's one I drew of my version of the production of cola. There's a few of these in my doodle book. I think I saw the idea somewhere. There's a good chance it was Art Attack. I drew these mazes everywhere. And things are getting serious when I start colouring them in. And I'll end on this little guy. I'm glad I still have my doodle book. It's fun too look through. And there are still a few blank pages, so maybe I should go back and fill them. I think I'm getting better at this sewing business. 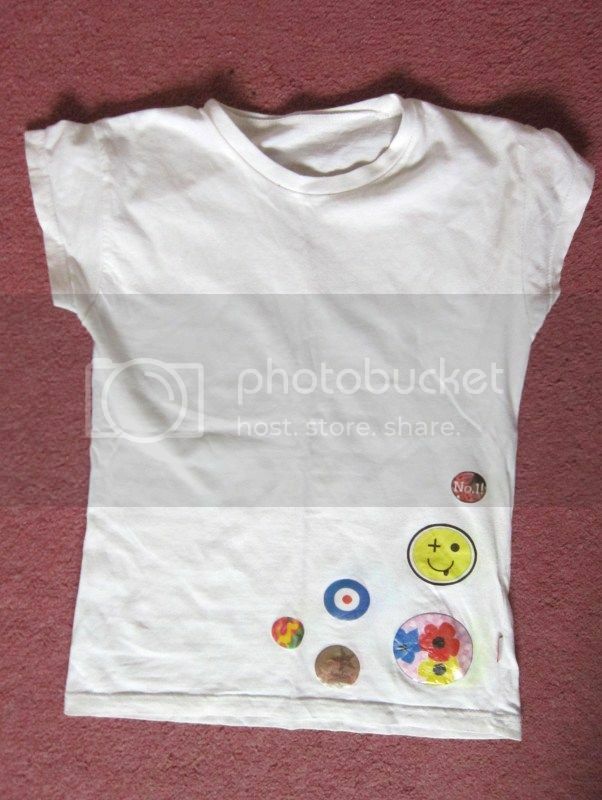 When I was sorting out my room I found this t-shirt that I'd intended to use as a pyjama top but I never wore it. Years ago I'd used it to try out printable transfer paper. Not so cool now. I found a couple of tutorials about how to make a t-shirt into a dress, like this one and this one, and modified them a bit too make them less little-girly. I even got adventurous and chose to add a peter pan collar. I made the pattern myself so it's a bit wibbly, but for a first attempt it's not too bad at all. I added a waist band to give the dress more shape which is attached at the front but not at the back so I'm able to tie/un-tie it. I also made an under layer for the skirt as the brown fabric is a bit thin. This past weekend was my town's Scarecrow festival. It's one of the things that makes it seem like Stars Hollow around here. This classic scarecrow was seen outside of one of the lower schools. My friend Lizzi and her family made this Gordon Ramsey scarecrow. He didn't always survive the strong winds we had on Saturday. The jubilee was a big theme. And my friend Laura's mum works for slimming world. So of course there was going to be a plump Queen. The Olympics was another theme and this awesome diving scarecrow also made reference to the hose pipe ban as the sign on the paddling pool reads 'water shortage'. I think this was my favourite as it's obvious a lot of time and effort had gone into it. Just look at that face! Wonderful. These two houses always work together on their entry. Last year they had scarecrows playing tennis over the fence, and this year the scarecrows were playing golf. Are there any quirky traditions where you live? Sorry if things have been a bit quiet around these parts this week, but I've spent six days doing work experience as a scenic artist. I started at 8am each day. Let's remember that I'm a student, an art student at that, so this was an achievement in itself. It was for a company called Set-Up (Scenery) who build sets for theatre productions. I got to wear these lovely overalls. But the end of the week they were a lot less white. I spent most of my time working on the floor for an upcoming Shakespeare play at the National theatre. We were making wooden panels look like paving stones. This involved sealing many, many 1x1metre squares of wood with button polish, then applying two layers of texture to them but spraying a thick, white mixture and smoothing it out with a trowel. The spray is what's on my shoes. They used to be pink. Then we applied a paint wash and I learnt that scenic art is a lot about how well you can flick water with a large brush. It was really interesting to find out how they create paving stones, having made miniature ones for my degree show house. Hopefully I'll be able to share photos when it's all installed in the theatre later in the year. Some of my art that's around my house I have put there, but some has been put up by my parents on their own accord. This triptych is hanging in the hallway right where you come in the front door. My Dad actually commissioned me to paint it. Another painting is hanging in the living room. Mainly because there was a spare hook there. This painting at the top of the stairs just appeared here when I came home from uni. In my sister's old room I've made use of the picture hooks she had in the wall. It's also where I store some of my larger paintings. And my other sister hasn't even moved out yet and I'm already using some of her shelves to keep my miniatures. So I have art work in almost half of the rooms in my house. I'm at home at the moment and I bought some of my things back from uni so I don't have to move out in one big go. It turns out I have a lot of stuff. This resulted in my desk looking like this. As much as I like my branch that I painted white and hung my jewellery on, it was time for a change. Cue the pile of guitar bits I got from my friend last year. You can see what I did with the whole guitar here. I got one of the broken guitar necks and drilled holes into the fret board, along the front and on the bottom edge. My Dad helped a lot. Thanks Papi! Then I screwed little hooks into the holes. To attach the guitar neck to the wall I needed to add a piece of wood to the head of the guitar so it was equal with the other end. Then we (mostly my Dad) used those hook platey things to put it on the wall, which was not easy but we (...my Dad) got there eventually. It's a good job I'm short because the necklaces hang just above my head. And for those of you who are slightly newer to my blog, you can see more of my bedroom, in miniature form, here. This is a 12x8" oil painting. It's based on a photo I took from, yep you guessed it, when I went to the beach a few weeks ago. When I'm making a miniature model I like to listen to podcasts, but when I'm painting I prefer listening to music. Music directly from a cd, instead of from my computer, so I listen to the whole album from start to finish which rarely happens nowadays since my mp3 player is permanently on shuffle. For this painting I was kicking it old school and listened to some Michelle Branch, the Walk the Line soundtrack, Robert Plant and Alison Krauss, and Joni Mitchell. What do you like to listen to when you're creating? Music? The radio? Or do you work best in silence? Hi guys. Being done with my uni work means that I've had time to make some new things for my Etsy shop. I've listed some cute little bow necklaces. And some new wire word necklaces. And while I'm promoting myself, here is the link to my art website (or you can just click the Art button above). There you will find my miniatures and my paintings all in one place. 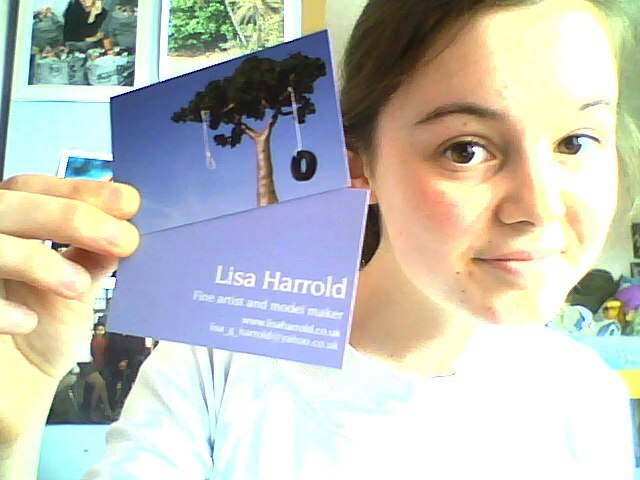 I got my business cards yesterday ready for the degree show. I'm like a legit artist now.